In 1996, a live-action remake of Disney’s 101 Dalmatians made its debut, featuring Glenn Close as the iconic villain Cruella De Vil. Not much is remembered about that particular version, except for Close’s vampy and dedicated performance which, even to this day, some are arguing if it’s the definitive version of the character. 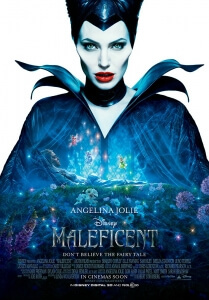 It’s very early days, but we’re calling it right now that Maleficent, with Angelina Jolie as the titular Sleeping Beauty villain, will tread a very similar path if not the exact same as 101 Dalmatians – not much to be said about much of it apart from that central lead performance. Jolie by far makes the movie work; her on-screen charisma is eerily charming and she is extremely fun to watch whether she’s conveying serious emotion or going appropriately over-the-top. This is clearly a passion project for Jolie, and with every second she’s on screen giving it her all you can see why. You actually see Maleficent rather than just an actress portraying the character, right down to the excessive cheekbones created by legendary make-up artist Rick Baker (who, perhaps wisely, decided against the character’s light-green skin from the animated version – that would have probably looked a bit too silly in real life). Outside of Jolie, however, the rest of the movie doesn’t fare as strongly. Maleficent marks the directorial debut of production designer Robert Stromberg, an Oscar-winner for Avatar and Alice in Wonderland. Because of those awards credentials, Disney must have thought it wise to entrust such a high-standard concept into someone whose only prior experience behind the camera has been in designing the sets. While Stromberg isn’t as bad a debut director as Wally Pfister, he’s not as good as Hossein Amini either; instead, he finds the middle ground by showing promise but also showing clear inexperience. He certainly has an eye for pretty images and colour schemes – even if some of the visual effects on certain characters either look too cartoony or come straight from the uncanny valley – but he struggles to find the right tone and feel to the movie – is it meant more for the younger Frozen crowd, or for the older Snow White and the Huntsman audience? In trying to satisfy both, Stromberg gives the film an uncertain identity and, thus, a confused tone. Some of the updates to the classic Sleeping Beauty story, or more specifically the 1959 Disney version, also produced mixed results. The reasoning for Maleficent’s apparent disdain for King Stefan (Sharlto Copley) is uncomfortably reminiscent of a family-friendly version of I Spit On Your Grave, with the metaphorical imagery bringing up some bizarre parallels with certain unlawful anti-feminist actions (rhymes with “grape”). It threatens to undermine her ferocity and loses a bit of its magic and mystery as a result. Also, fans of the original Disney cartoon will be rather frustrated by the portrayal of the supposed “good” fairies here – as before, they are entrusted with looking after baby Aurora (played as a teen by Elle Fanning, who actually does bring life and charm to an underwritten character) but here they seem to be so incompetent at doing this one task that Maleficent herself actually takes care of the child more than they do. You can’t fault actresses Imelda Staunton, Lesley Manville and Juno Temple for being given such demeaning and irritating roles, but they are written so poorly with mediocre attempts at comedy that after a while they actually become more of a nuisance than a comforting trio of supporting characters. That being said, however, the decision to establish a friendship between Maleficent and Aurora does make for some interesting confrontations. The chemistry between Jolie and Fanning is solid, and though a handsome prince does eventually come into the mix at some point the way they work around this plot point and introduce something fresh (or as fresh as it can be post-Frozen) is well-handled and fits fine into the story they’re trying to tell – which is good, because Maleficent wouldn’t have been much else without these positive additions. Maleficent turns out to be neither disaster nor triumph, with some elements – including Angelina Jolie’s passionate performance – working much better than others, all leading to a final project that’s just decent enough for audiences to swallow up.